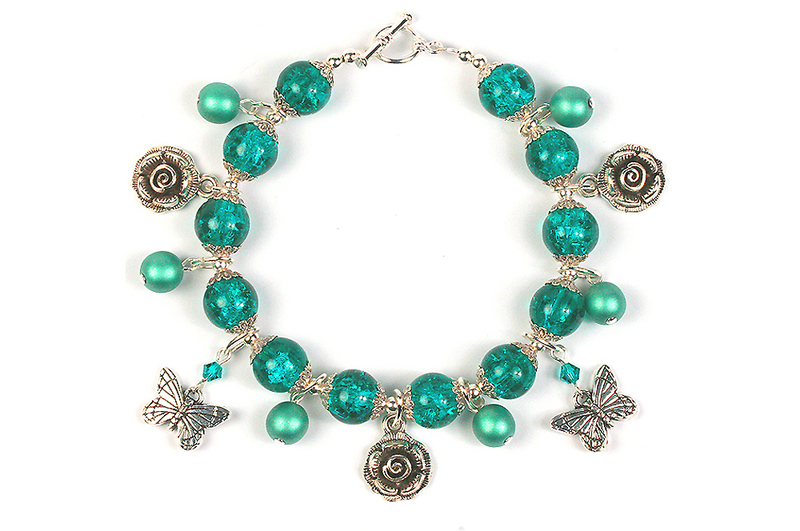 Strung charm bracelets can easily be made by threading some pretty beads and attaching charms and dangles between them. 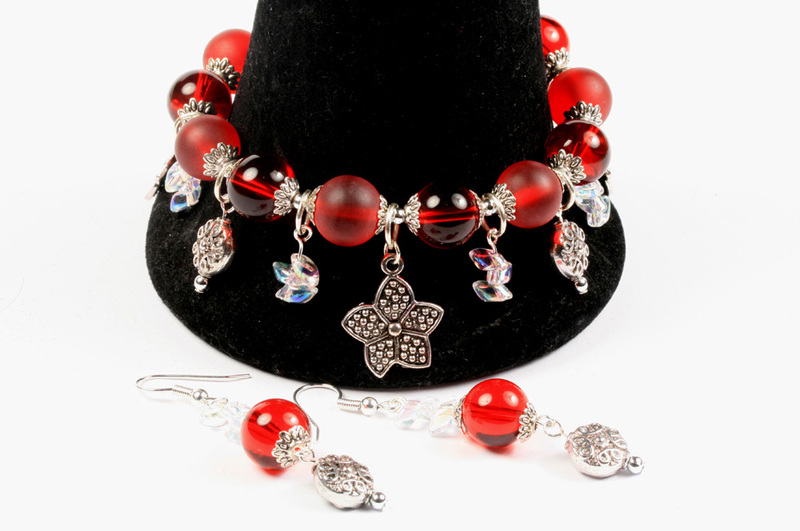 Once you’ve made one you can easily adapt the basic technique using different types of beads or adding more charms to give a different look. It is very easy to make a strung charm bracelet. Our top tip is that a little planning before stringing will help you assemble it quickly. We used shiny 12mm glass crackle beads and 8mm Czech glass beads with a matt metallic coating to give an interesting mix of bead types. Thread each pearl onto a headpin and make a loop to attach them to a jump ring. Lay out your dangles in the order you wish to use them. Next make the basic bracelet. We used calottes to secure the thread and added a small metal bead. We then strung on a bead cap, crackle bead, another bead cap and a small metal bead. Then we added on the first pearl charm by passing the thread through the jump ring. Continue in this way until you have used all the beads, making sure that you add a small bead between each of the embellished crackle beads. Then just secure the thread using a calotte as before and attach a pretty toggle clasp. Your strung charm bracelet is now ready to go! 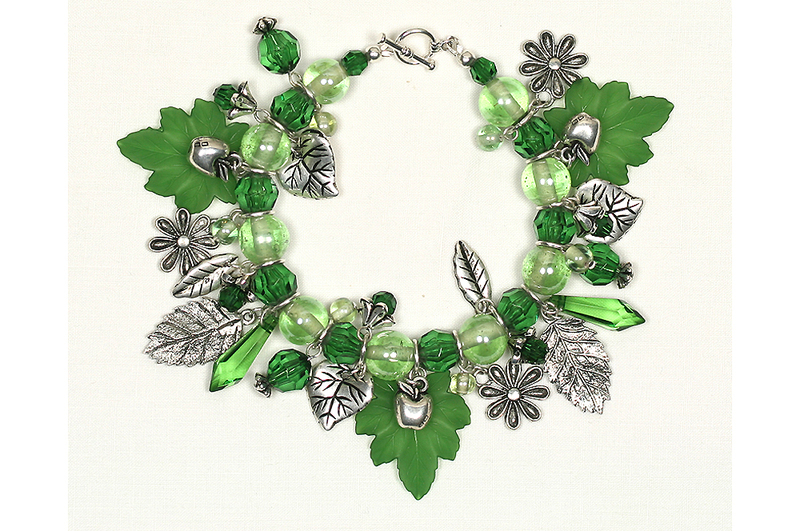 Here is a variation of this type of charm bracelet. For this we used frosted and transparent 8mm glass beads. To make the dangles we used a large flower charm for the focal point and alternated dangles made with small glass beads and dangles made with metal beads. 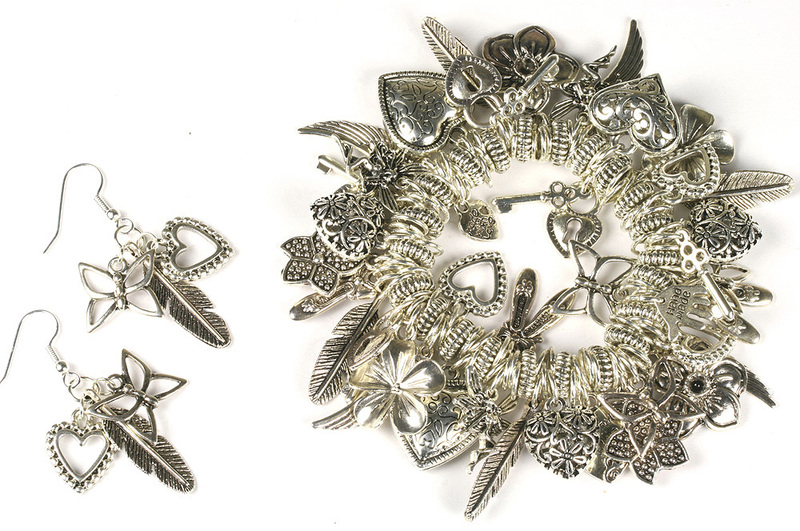 You can also adapt this technique to give a much fuller look to your strung charm bracelets. For this bracelet we strung the beads on with no small beads or bead caps. We kept interest by using slightly different sizes, shapes and colours for the beads. We also added two dangles to each of the jump rings before we threaded them on, either a very small charm or a small bead. We also embellished some of the beads used for dangles by adding a small spacer bead just below it or adding a beadcap before making the loop on the headpin. If you like a chunky look, its very easy to create a charm bracelet using stretch elastic. This is a good excuse to just pick a good selection of your favourite charms to make a quick and easy silver bracelet that will be very versatile. Attach a jump ring to each charm – we chose about 20 charms and used 9mm jump rings. Lay the charms out in order, making sure there is a good distribution of shapes and sizes. Have a pile of about 100 spare jump rings. Also, have the same number of spacer beads as charms. Then take 0.5 metres of stretch elastic and simply thread it through a spacer bead then 5 jump rings , two of which should have charms attached. Keep repeating the sequence until they are all threaded on. Check the length for fit and then tie off the stretch magic securely. If you want to change the order of the charms, simply open the jump rings and swap them around until you are happy with the overall effect.